Today we have the ultimate arcade game for all of our readers. 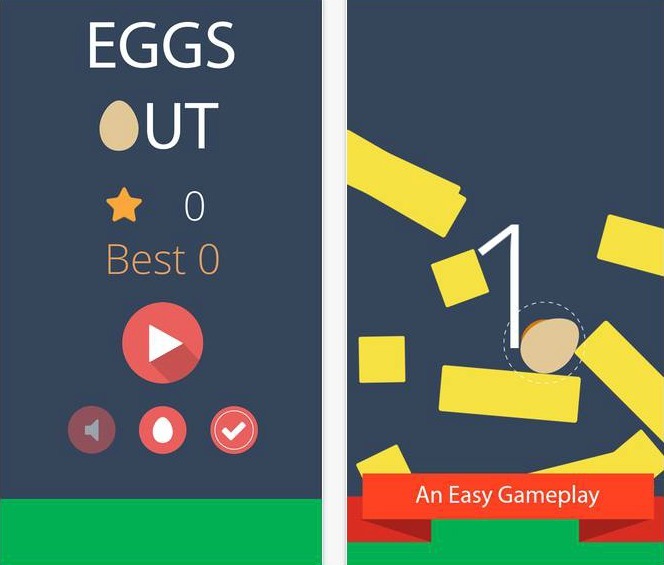 Relatively new, Eggs Out is one of the most entertaining games you can find these days on the Android, iOS and Windows platform. Developed by Pixelgate Studios, this cross-platform gaming app is full of colorful backgrounds and addictive gameplay that will glue your hands to your device. The sound effects and the melodies will engage you even more! The Eggs Out has simple gameplay, yet it is so hard to be mastered. Once you start playing, you will learn quickly how to play and you won’t be able to put your phone down! Just tap on your screen and guess where the egg will fall and stop in order to get the best score. Play, score higher, but note that the score stacks up when you fail a level. Cover the target’s area to collect the stars and use them later for unlocking more awesome eggs. If you cover the white area you’ll get one star, if you cover the yellow area with the egg you’ll get two stars and if you cover the orange area with your egg you’ll get three stars. Try to be the best player by winning more and more levels and by collecting as many stars as you can. You can share your score on your Facebook account and challenge your friends. Make sure to share the fun and invite them all, download Eggs Out for free from Google Play, the App Store and Windows App Store.